Once Upon A Time’s best season premieres have an intriguing premise to keep us hooked for the rest of the season. Last year’s “Dark Swan” meandered a bit, but had a satisfying payoff with evil Emma strolling in to the dismay of her family and friends (unfortunately, she didn’t turn out to be nearly dark enough, but that’s OUAT for you). The show’s season six premiere—and really, it should know better by now!—is a similar mish-mash, but without the satisfying payoff. We already knew the Evil Queen was bound to show up sooner rather than later. We won’t be doing regular reviews of OUAT this season, and I have to say, after this premiere, I’m kind of glad, even though I’ve been reviewing this show off and on since 2013. The last premiere I was this lackluster about was the Frozen arc, but at least that had a familiar frame to hang on. This one is just a mess. Worst off: Emma has a shaky hand that means she’s going to die soon? We just spent an entire season in the Underworld, saving Hook from death, and now we have to worry about hers? That’s not a plot point that makes me want to watch this show for another second. I don’t even care who’s under the hood; the only thing that would make it interesting if it was someone like Hook or Charming, but the show unhelpfully has them trotting in after her, so we know it’s not them. Hyde as the apparent Big Bad is not helping; he talks so slowly, this season is already in danger of being dragged out more than it already is. A promising tease with Aladdin just leaves us hanging, and the reveal of various shaky-hand Saviors (to counteract all the Dark Ones, I guess) sounds like someone’s been boning up on their Buffy The Vampire Slayer reruns. Next up in the contrived department: Belle and Rumple, forever and ever, amen. 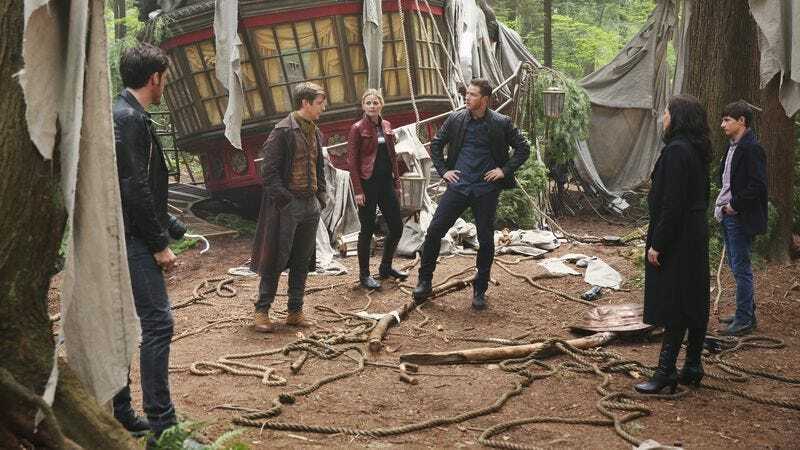 I guess it makes a stretching kind of sense that their kid would be Morpheus, god of dreams, and he’s right that Belle should not fall for Rumple’s malarkey yet again. Over the past five seasons, Rumple has blown many chances, and all the throwbacks to the movie in the world (saving the teacup! a dancing lesson that went on for quite a while!) won’t change that. Robert Carlyle has always been the best thing about this show, but it would be great to see his Rumple efforts directed elsewhere. Maybe he can spend this season trying to win over Morpheus instead, so that he has an offspring that doesn’t hate him. Maybe he can hang out with his grandson, who grows more ginormous with each passing season. Please, anything. Lastly, Regina battles Zelena, but we all know she’ll be battling herself. Very little made sense here: What kind of stuff is Zelena moving in boxes? From where, exactly? Oz? Doesn’t she still have enough magic to be able to have those boxes unpack themselves? And why tell Regina about a feather if she didn’t actually have it? And here, most importantly: Why get so up in arms about a feather? A heart to heart with Snow (who chides, unhelpfully, “I think it will work out, though”: Snow, no one is surprised by this, as it is literally your m.o.) just treads familiar ground. The only interesting part of this is which side Zelena will fall on, as she’s caught between the two halves of Regina’s self. I don’t mean to sound so bitter: I’m not mad, just disappointed. I was looking forward to Once coming back, because for all its craziness, it has the possibility of being enjoyable, as well as one of the few shows I enjoy watching with my kids (back to Dancing With The Stars for us! At least it’s on the same network). This year, Once is throwing out the split-in-half seasons with varying arcs. Even though that sounded like a good idea when I first read about it, this premiere is making me wonder. Once needs more structure to hold in all the mania; otherwise you just have a crazy floating ship that will just pour out story after untold story. And “story” now takes its place in the show’s vernacular, thanks to the creepy Oracle: Regina wants to change hers; Emma learns that hers is shorter than she might have hoped. Once loves to tell us that, heroes or villains, we all have the opportunity to rewrite our own story. It’s just a shame that after five full seasons, Once Upon A Time seems to have tapped its own particular storytelling well. I guess if you can’t get Naveen Andrews to come back from Once Upon A Time In Wonderland as Jafar, The Mummy’s Oded Fehr makes a decently menacing substitute. 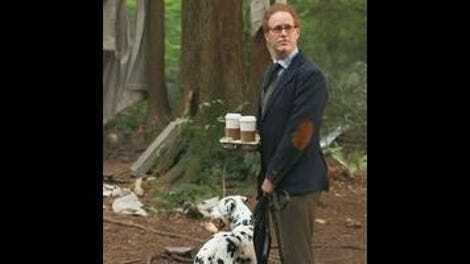 Our own Myles McNutt has a thing about coffee cups that are clearly empty on TV shows. I would like to add people lugging around blankets that are supposed to be babies, but clearly just have an eggplant in there or something. Zelena coming home to find the Evil Queen and carrying her zucchini or whatever was just the worst. Best line, from Emma to Hyde: “Keep calling me girl and see how that works out for you.” Also, Emma and Hook were pretty cute this episode. Well, except for the lying. One of my biggest regrets about not reviewing this season is missing out on all of your comments, which was always my favorite part. If something amazing happens, or if there’s a story coming up that I won’t want to miss, hopefully I can drop in over the season from time to time.